History tells us that there were nine Crusades throughout the Middle Ages, all of them ultimately doomed to failure, though some took longer than others. As related in the recent BBC series, the motivations of those involved in the Crusades - and in resisting them - were an unusual mixture of religious devotion and venal plunder. Often both at the same time. But none were quite as venal and self-serving as the Fourth Crusade. Originally inspired by Pope Innocent III, the Fourth Crusade was meant to free Jerusalem by invading via Egypt. There was only one problem: a lack of cash and ships to facilitate the invasion. 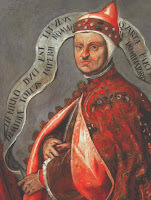 Which is where Enrico Dandolo, the Doge of Venice, came in (pictured). He was more than willing to fund the Crusaders if they would only repay him by solving a few 'trading problems' he had along the route to Egypt. And his biggest problem was the Byzantine Empire, with its capital in Constantinople (modern day Istanbul). The Byzantines had refused to give the Venetians a monopoly of trade along the profitable routes dominated by Constantinople, instead playing Genoa against Venice is a game of power balance by offering them competing trading rights. Enrico Dandolo was having none of it and as the Fourth Crusade sailed into Constantinople - on route to Egypt allegedly - he increased the pressure on the Crusaders to pay the exorbitant fees he had demanded for their transport. Eventually the Crusaders saw only one way to repay their debts: to sack the city of their hosts, which they duly did in an act of extraordinary Christian-on-Christian barbarism. The sack of Constantinople so horrified Pope Innocent he excommunicated all the Crusaders. A gesture in marked contrast to the papal blessing given to previous Crusades, whose participants were assured of absolution for their sins because of their sacrifices. Back to the 21st century. Are we about to witness a repeat of the Fourth Crusade? Again Greece - the cultural and historical heartland of Byzantium - is on the receiving end of visitors whose intentions, we are told, are entirely 'noble and true'. I'm referring, of course, to the German demand to impose a Proconsul on Greece to ensure their elected politicians don't do anything silly like prioritize Greek citizens over European banks. Wolfgang Schauble playing Enrico Dandolo perhaps? Already most European politicians have reacted in horror to the idea - as did most right-thinking Christians at the sack of Constantinople by the Crusaders. But it didn't stop the attack on Byzantium back in 1204 - and it probably won't in 2012.